60 MINUTES, ONLY YOU, YOUR FRIENDS AND A ROOM FULL OF PUZZLES. COMPARE YOURSELF WITH THE LEGENDARY SHERLOCK HOLMES. 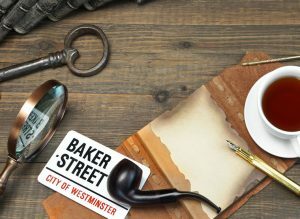 Experience an adventure in the Sherlock Holmes's world and challenge a dangerous serial killer. London, 1888. The discovery of a corpse reopens the case of a dangerous serial killer who has killed at least 145 victims. You find yourself at a crime scene and you have only 60 minutes of time to analyze all the clues, find out the identity of the killer and catch him before he manage to vanish again into nothingness. You will have to show all your skills of deduction and observation to avoid overlooking any possibility and not miss any particular clue. You’ll have on pair of the famous detective Sherlock Holmes. Elementary watson! Note: within the room there may be contents not suitable for children under 16 years or for particularly sensitive people. Online bookings can be made until 4 hours before the game. Sherlock Holmes is a special room, where intuition and observation skills are essential.